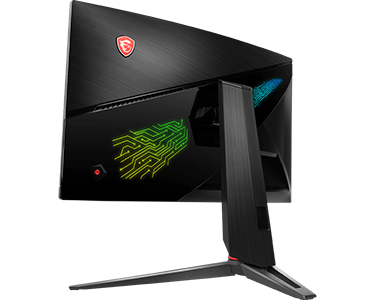 MSI is a name whose absence has been conspicuous in the gaming monitor market. Others, notably Asus, have muscled in on this lucrative territory with a range of premium models accommodating stylish designs, both forms of adaptive sync technology, and high refresh rates. 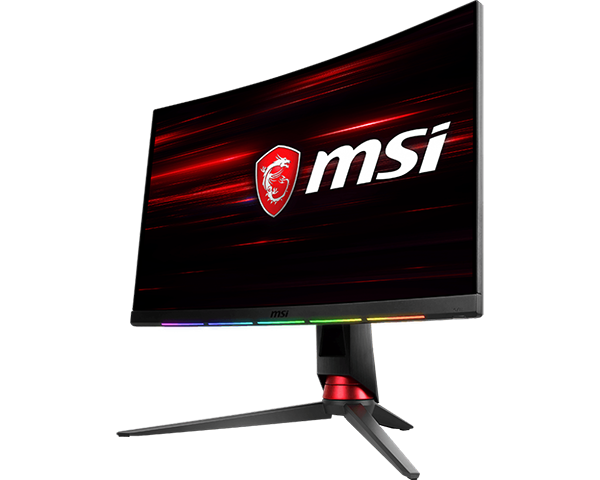 Not to be outdone, MSI, in recent months, has begun shipping its own range of gaming monitors under the Optix line. Today's review model is arguably the most interesting of the lot, fitting in a gaming-friendly 2,560x1,440 resolution, 144Hz maximum refresh rate, 1ms response time, a gentle curve, purportedly excellent colour gamut reproduction, FreeSync compatibility and RGB to boot. Yup, RGB. Quite a list of accomplishments, so let's take a closer look at the Optix MPG27CQ. And it's a good-looking piece of kit on first blush. The hefty triangular stand attaches easily into the main arm - equipped with a 100mm x 100mm Vesa on the other end - and is secured via a captive thumbscrew, though do be aware that the overall footprint of the stand is 55cm wide and 40cm deep - the latter may cause a minor problem on thin desks. 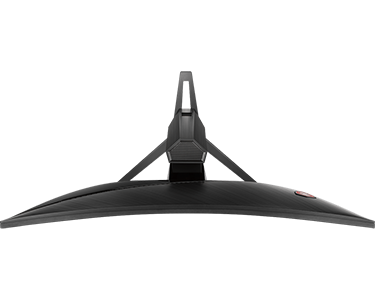 Unlike cheaper monitors, the total 7.6kg weight means it doesn't wobble when punching the keys or slamming the mouse in fast-paced action. There's also generous height adjustment of up to 120mm, it swivels 40° in each direction, and there is the usual -5° to +20° of tilt. The headline-grabbing feature is the RGB lighting at the bottom. Five light bars look genuinely tasteful and are immediately active when the monitor is switched on via the small physical button on the right-hand side. The lighting circles through pre-defined patterns by default but can be changed to pretty much anything you want via SteelSeries' Game Engine 3 application. It works well and the lighting is bright and even across the bars. It is angled downwards at a 45° angle, minimising the impact on the screen, and a notched section above further hides it from being directly in your vision. Interestingly, and adding a potential gaming twist with the same software, the MPG27CQ is compatible with GameSense technology where you can sync RGB effects based on what's going on in the game. It's currently only supported on a few titles, however, yet it's kind of cool to know you are running low on ammo when the light bars begin displaying a block of red, visible in peripheral vision. The concept has legs, but we're not sure how many further titles will take it up given that the technology is three years old. The rear is also home to some funky, controllable lighting across both sides, reminiscent of recent premium Asus screens. Keeping up with the Joneses requires joystick control for the decent OSD, though we feel it is a little too far in to reach comfortably from the front; moving it another couple of inches towards the edge would make all the difference. If you don't like fiddling with the menu, the settings are replicated in a Windows-based app, too. Back to the screen, there's a gentle 1800R curve which is not readily apparent when looking head-on. The effect is subtle on a 27in monitor and we can't work out whether we really like it or not on a gaming screen. 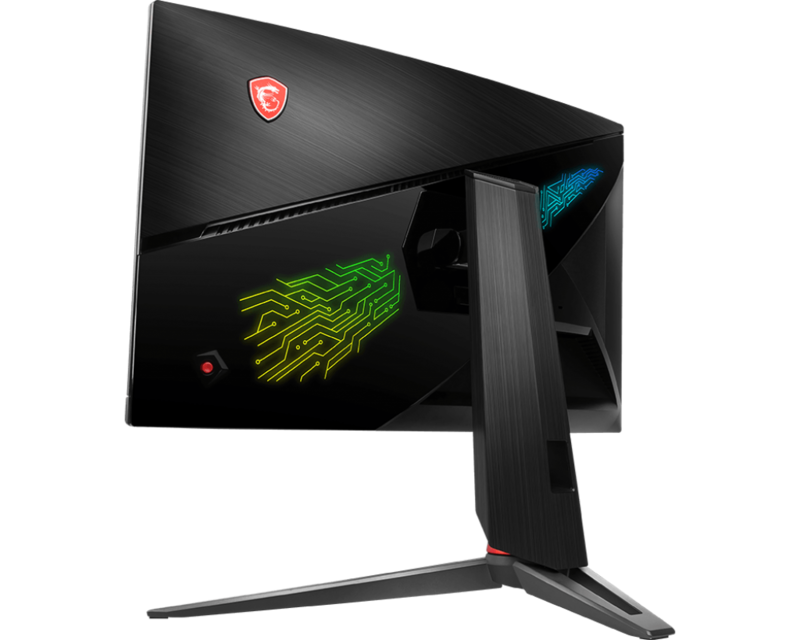 MSI touts this as a frameless design; that's not entirely true, as while three sides have a slim border, the actual panel sits a few millimeters further in. We'd imagine that putting two side by side ought to provide a decent experience. MSI uses an effective anti-glare coating that reduces most of the reflections. 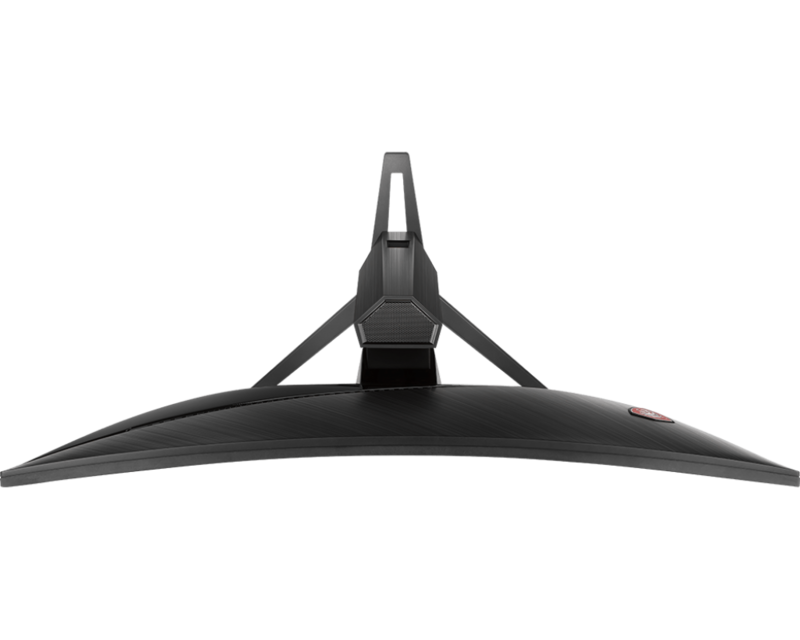 Optix MPG27CQ's specifications are robust. The panel has the aforementioned 144Hz refresh rate, impressive claimed 400cd/m² brightness, and 100/115 per cent of the NTSC and sRGB gamut. 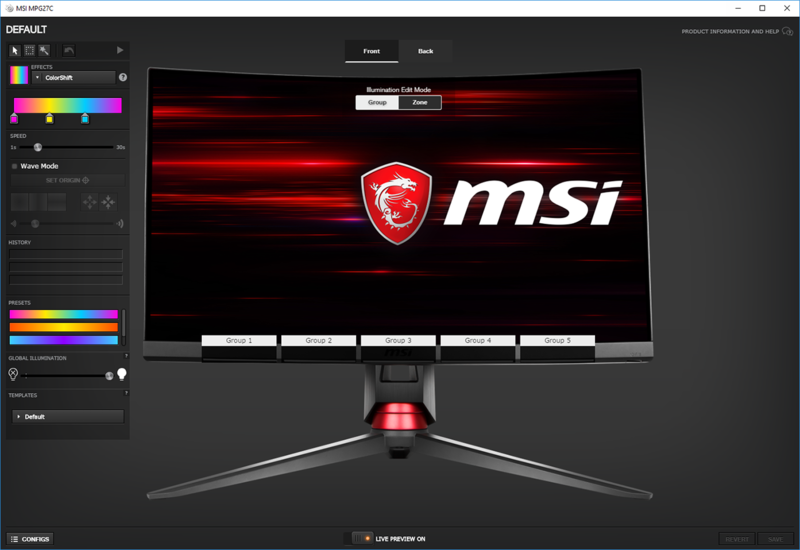 Strangely, MSI doesn't promote the adaptive framerate technology yet delving deeper into the OSD menu - to a screen that you wouldn't normally see - shows that FreeSync is supported. Specifications indicate there's a suitably wide range, from 48Hz to 144Hz, and low framerate compensation, useful for sluggish scenes, is available, smoothing out motion across the framerate range. The newness of these Optix screens is indirectly highlighted by not having any entries in AMD's otherwise comprehensive FreeSync table. 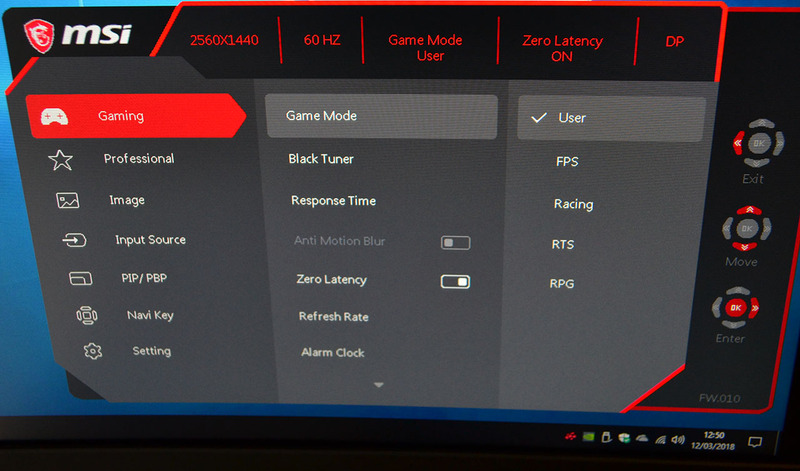 And while we're on the subject, activating FreeSync automatically disables the screen's anti-motion blur technology. The relatively svelte profiles necessitates an external power brick, while inputs are pretty standard, coming in with DisplayPort 1.2 and dual HDMI 2.0. There's also a handy dual-port USB hub, necessary for toggling various RGB and on-screen options, on the left-hand side alongside headphone and microphone ports. 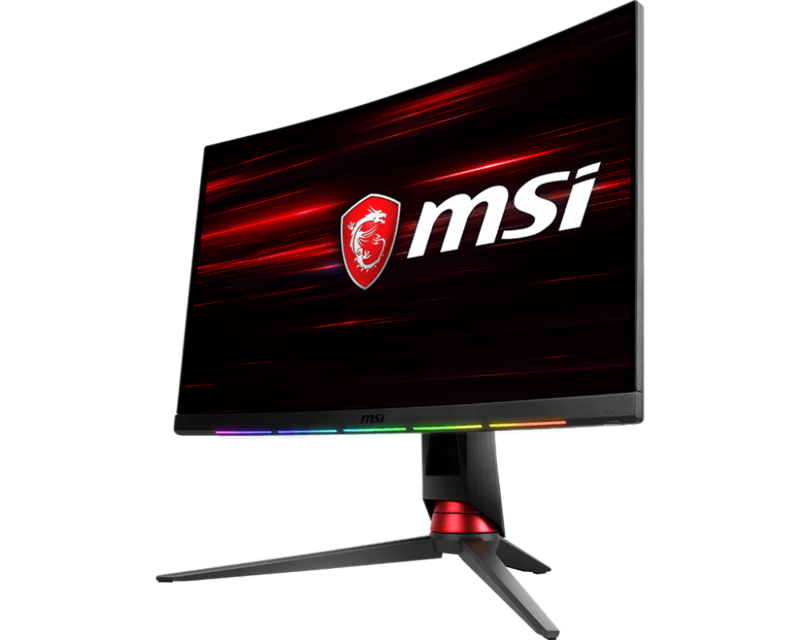 Our initial inspection shows that MSI tries to cover a number of markets with the MPG27CQ, aiming it indirectly at content professionals as well as the obvious gamers. Priced at around $500, let's now see how it performs in our tests.